Cracker Barrel Old Country Store® today announced that Dolly Parton is its latest Spotlight Music artist. The legendary singer will exclusively release a deluxe version of her new album Pure & Simple in Cracker Barrel stores nationwide and online at crackerbarrel.com on Friday, Aug. 26, 2016. This deluxe offering of Pure & Simple features 10 new tracks inspired by Parton’s East Tennessee roots. 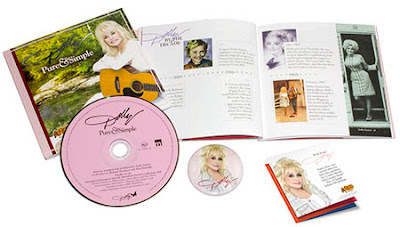 The album is complemented by several pieces of content exclusive to Cracker Barrel, including two versions of the singer’s chart-topping hits “Jolene” and “9 to 5” recorded live at Glastonbury Festival and a 48-page magazine filled with photos and interviews highlighting memorable stories from Parton. The deluxe edition also includes coupons to various Parton attractions. Parton is an iconic superstar with more than 100 million records sold worldwide. She has garnered 25 No. 1s on the Billboard Country Music Chart, received seven Grammy Awards, and is one of only five female artists to win the Country Music Association’s Entertainer of the Year Award. “Dolly has been a wonderful friend to Cracker Barrel for many years,” said Cracker Barrel Old Country Store Senior Marketing Manager Julie Ulmer. "With our shared Tennessee roots and authentic Southern styles, Dolly and Cracker Barrel are a natural fit. From limited edition rocking chairs to exclusive and gold-certified albums, we’ve had a long and successful relationship, which we're incredibly proud to continue today." Cracker Barrel has released albums with a wide variety of artists, some of which have debuted in top spots on a range of Billboard charts. Recent Cracker Barrel Old Country Store Spotlight Music partners include the brand’s first pop albums with a cappella group Pentatonix and “Fight Song” singer Rachel Platten, its first R&B album with Anthony Hamilton, as well as recent albums from Cole Swindell, Blake Shelton and NEEDTOBREATHE.